« Where’s My Email Attachment? Afterwards, Word no longer hangs. 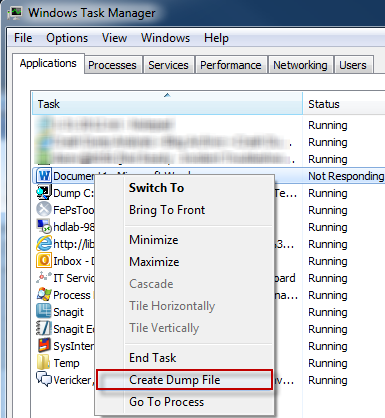 I discovered after writing this post you can use the 32bit version of the Task Manager to obtain a 32bit dump in a 64bit OS. The 32bit version of the Task Manager can be located in C:\Windows\SysWOW64. This entry was posted on February 8, 2012 at 12:45 pm	and is filed under Troubleshooting, Troubleshooting Tools. Tagged: Dump, Hang, WinDbg, Word. You can follow any responses to this entry through the RSS 2.0 feed. You can leave a response, or trackback from your own site.